The SB-3691 is the professional 2x1 HDMI PiP PoP Selector Scaler Switch in 1080p. Supporting (2) HDMI Inputs and (1) HDMI Output with Picture in Picture (PiP) and Picture of Picture (PoP) features that can be easily configured and controlled. The PiP and PoP functions are only available in 1080p; any other resolution will disable the PiP/PoP ability. Supports video resolutions up to 1080p with a signal bandwidth of 165MHz and a data rate up to 4.95Gbps with no signal degradation. 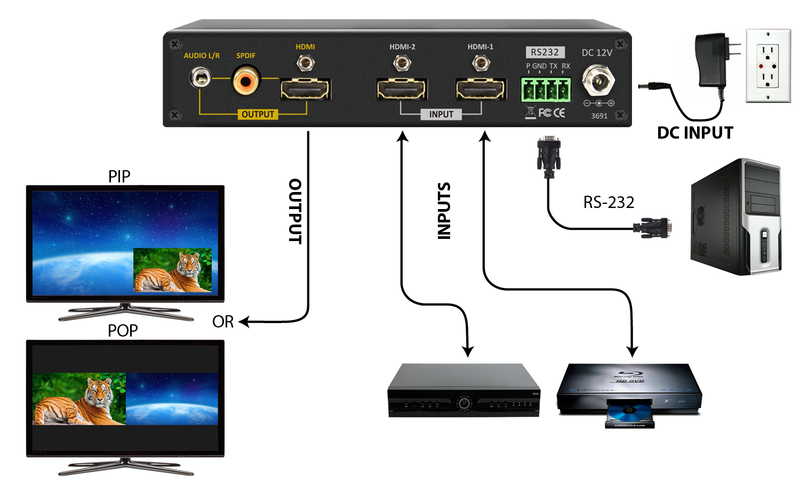 The SB-3691 is HDMI 1.3 and HDCP 1.2 compliant, with CE and FCC certifications. Zoom management can be selected between (3) levels. Input resolutions can be scaled up to 1080p or down to 480p. Supports menu for controlling brightness, contrast and saturation. Control is provided via front panel buttons, RS-232 or wireless IR remote control (included).